This very detailed map is one of a group of 4 published for Darlington. It is double-sided for maximum coverage, and shows the area on the west of the town. The main map covers an area from Stanhope Green and Larchfield Street (near the centrre of town) westward to Mowden and Hillclose House, and from Bell Lane southward to Duke Street. This is a suburban area, with a few terrace streets at the east side of the map, then villas and larger houses along Woodlands Road, leading to open countryside at the west of the map. Features include St Clare's Abbey, Stanhope Green, Pierremont, Brinkburn, St Joseph's School, horse tramway along Woodlands Road, West Lodge, Carmel House Convent, Pierremont Park Nursery. Part of Cockerton is on the map, including The Green. 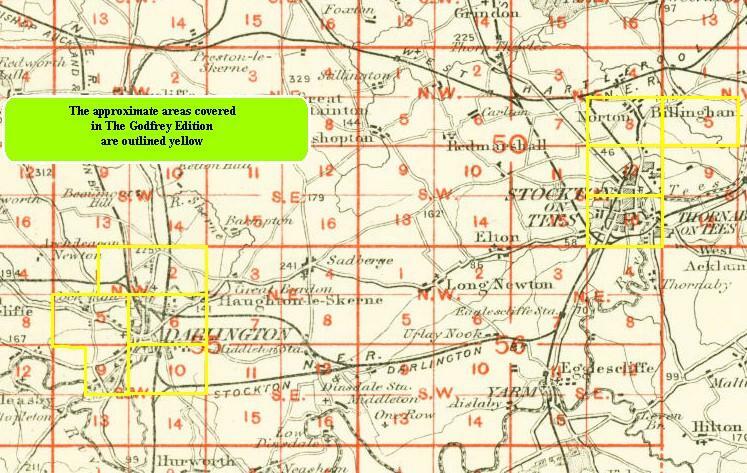 On the reverse is half of adjacent sheet 55.09 extending coverage south and this includes Coniscliffe Road as far west as Carmel Road. Blackwell Hall is near the SW corner. Features include Blackwell Grange, Blackwell Mill, Harewood Hill, West Cemetery. The map links up with Sheets 55.06 Darlington and 55.10 Darlington South to the east. Follow this link for a complete list of our Stockton & Darlington area maps.